It seems we’re in a time where everything is in constant change and improvement. It’s not “good” just to sit idle. We’re bombarded with the constant upgrade packages and the latest and newest this or that. If you’re in a job more than three to five years now, you’re viewed as a slug (who’s not moving forward or progressing). And if you don’t upgrade that house or car, are you really making it in the world? Thought it would be fun to look at some things we often think need to be upgraded – but probably don’t. If anything, I want this post to affirm your thrifty ways and assure you that you are not alone in No-Upgradeland. Once you have something that does what it needs to do, why do you need to get something that does it slightly different? We recently had the chance to upgrade our Vitamix to a newer, more “automatic” blender. The thing is, it didn’t really work all that well and felt like a downgrade. Frustrated and perplexed, we went back to using our older, “manual” Vitamix blender. Ironically, this one works much better than the newer, more advanced model. If I didn’t have access to obtaining free phones from our partners and reviews we’ve done on MVNO cell providers, I’d probably still have a flip-phone. All I need a phone to do is text, talk and (sometimes) allow me to surf online. Of course, a nic(er) camera is a perk – but not a must-have. Beyond that, why do I need to upgrade that thing every year? (Right now I have a cracked screen / and lower-end Android phone that serves my needs). This is a biggie for me. If I can get from point A to point B without it pooping out on me, I’m grateful. I’ve never been much of a car enthusiast – so having a special car or going all out on it isn’t something of top priority. And these things (like most of our “things”) are dropping in value. 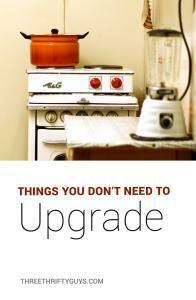 Unless you are a growing family, you likely never need to upgrade your home. In our 9 years of marriage, we have lived in a modest townhome. And, if I had my way, we’d even be downsizing from that. I’d love to give living in a tiny home a try (like our friend Lamar). This is one of the most frustrating parts of purchasing software now-a-days: the subscription model. Instead of charging a one-time fee for software purchases, companies have wised up and decided to charge you a “subscription” fee so they can maintain recurring revenue. I get the updates happen to software and its often essential to keep them humming along – but I wish this pricing never crept into software. And it seems with memberships, there is always the option to upgrade from a “basic” plan (that typically suffices) to something costing more money but not a lot of value. As previously mentioned, our dryer from the 80’s is still humming along. While it literally hums (and there is some other work to do on it) it’s lasted for many years and hope to keep it for more to come. Often, upgrading appliances is more of an aesthetic choice (we’ve been there). Are there any others that I’ve missed here?